Does it cost anything to run a spirit wear program? It doesn’t cost the school a penny, and you do not need to purchase inventory to have on hand. 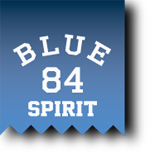 Blue 84 will produce and ship only what your staff and families order, and our custom garments are guaranteed. How do we promote our sale? Blue 84 provides your school with one colorful paper flyer for each faculty member and student. All you have to do is pass them out and send friendly reminders along the way. We all get busy, and even those who intend to order can forget. How do I order my new spirit wear? We will set up custom designs on an online store especially for your school. Each person orders directly from the website. From there, it is much like any other online ordering experience! If I would like to know how a specific garment fits, how would I go about this? 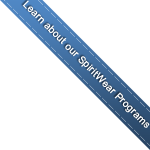 You can check the sizing chart on the website, or you can simply call Blue 84 Spirit customer service at 1-800-328-6681. They are real people, and they can help! Because we like to let them out once in a while, please call Monday-Friday 8AM-4:00PM CST. Thank you! You place items in a virtual shopping cart and proceed to checkout. We ask you to create a username and password, to help us keep your info safe, and then you can pay with any major credit or debit card. We do not share your personal info! Is there sales tax or shipping on orders? No. The price you see online is the price you pay. All taxes are paid to Uncle Sam by Blue 84 and included in the price of every order. We will even take care of the shipping charges! On all online orders, you will receive a friendly email confirmation that your order has been received shortly after you purchase your new gear. How long does it take to receive our orders? After your program ends, production takes two weeks plus shipping time. Students’ orders are bagged by teacher or coach, each with individual packing slips, for easy distribution. Whew, that was easy! Do online orders ship right to the purchasers house or to the school? All orders ship to the school packaged by student and classroom for easy distribution. Want cash back? Start earning 10% back once your orders reach $2500. The higher your sales, the larger your check. When can we expect to see our rebate check of 10% cash back? Once your program has ended and all garments have been shipped, you can expect your check to be sent on the 3rd Friday of the following month. Does Blue 84 require a minimum purchase or contract with the school? Yes, we will need at least 36 items order per online store in order to start fulfilling orders. Make sure to remind parents and staff when you ordering deadline date is coming up. We like to stay local and we have someone we currently order t-shirts through. That is great. We could not agree more. Our company was built on, and still runs on small town values. We are not asking you to switch vendors, rather asking you to give your students and faculty a chance to wear garments and designs that your local supplier most likely cannot offer. Win-win! How many volunteers should I expect to recruit for this spirit wear program? Just one person! A savvy individual needs to approve the art, distribute and collect materials, hang posters and communicate with Blue 84. We would even suggest you promote via your website, facebook or twitter! If I am experiencing issues with ordering or the website-who should I call? All sales are final. We do not accept returns for refunds or exchanges.